Man Utd will look to make it 11 games unbeaten under interim boss Ole Gunnar Solskjaer when they face Fulham at Craven Cottage on Saturday. The Norwegian tactician has led an impressive turnaround for the Red Devils, as they now sit just two points adrift of Chelsea in fourth place. With that in mind, a win could move them into the top four, temporarily at least, as the battle for Champions League qualification heats up with Chelsea travelling to leaders Man City on Sunday. Solskjaer may well have one eye on the Champions League clash with Paris Saint-Germain on Tuesday, and so there are changes to his line-up to face Fulham, as seen in the club’s tweet below. One of them is particularly key, as Victor Lindelof has seemingly been rested despite being an ever-present under the interim boss. Instead, Solskjaer has gone with a centre-half pairing of Chris Smalling and Phil Jones, with the former returning from injury to face his former club. Diogo Dalot gets the nod at right back instead of Ashley Young, while Juan Mata and Romelu Lukaku start in an attacking trident with Jesse Lingard and Marcus Rashford dropping to the bench. 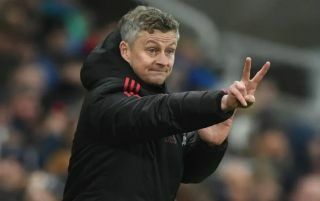 In turn, it could be considered a risk from Solskjaer in terms of disrupting their momentum by resting key individuals, but he has plenty of quality at his disposal in the squad and with a busy fixture schedule, he’s certainly using the options available. As noted in the tweets below though, the decision to start Smalling and Jones together in the heart of the defence hasn’t gone down particularly well, as they have struggled in the past to offer a solid base on which United can go out and win games. That’s reflected in the goals conceded column so far this season, as they’ve leaked 35 in 25 league games, giving them the second-worst defensive record out of the top eight sides.
? Today’s #MUFC starting XI for #FULMUN ? Poor De Gea. Jones AND Smalling to deal with.